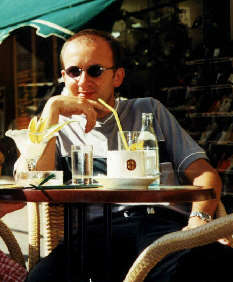 Stephan Müller from Herborn / Germany started the web-site www.kundera.de in July 2000 in order to offer more information about Milan Kundera in the web. The English section is dated end of September 2000. This site has the purpose to fill people with enthusiasm for the work of Milan Kundera. Note: The English version is not as complete as the German one is! Please do not hesitate to mail us if you have suggestions, more informations or questions to our site or if you found any mistakes. What´s new about Milan Kundera? On this homepage there are several links to other internet-pages. We want to specially underline that we have no influence on design or contents of those linked pages. Because of that we dissociate us from all contents of all pages on which we placed a link on our homepage. Their contents does not express our opinion or will. All pictures and texts on our homepage come from free accessable pages in the internet. Please excuse if we should violate any copyrights through publishing those on our homepage. Please inform us if you can maintain any copyrights on texts or pictures. We will immediately delete those passages and objects from our internet presence.